Recumbent bikes and recumbent trikes are both good choices for people who need the back support that an upright bike doesn't offer. Recumbent trikes outsell recumbent bikes, especially with the older crowd. More than 75 percent of the two biggest trike manufacturers' customers are over 50, according to the AARP Bulletin. Both recumbent bikes and trikes will give you a cardio workout, though the recumbent position is less intense than that of an upright bike. If you want to load your cycle in the car and drive to a bike path, a recumbent bike is lighter to pick up and fits in a car more easily than a trike. Bikes are also less expensive -- you'll pay for that third wheel. Some riders enjoy the feeling of freedom of a bike over a trike, as two-wheelers respond to things like shifts in weight. When riders trade an upright bike for a recumbent, they notice that being so close to the ground makes it harder to balance on two wheels. The trike eliminates this problem; three wheels make for ease in balancing. Because trikes are wider than bikes, you might want to stick to bike paths or roads with wide shoulders and little traffic. 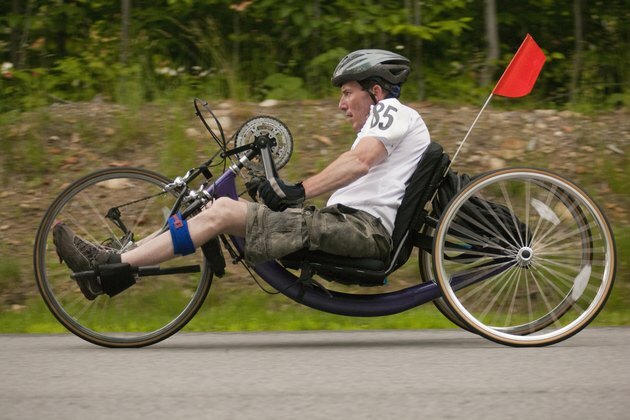 The recumbent style allows some people with disabilities to ride bikes who would otherwise be unable. The outstretched angle of the user's legs is easier on those with arthritis or other knee problems. People with Parkinson's and other diseases that compromise balance can likely more safely ride a recumbent trike. This is a big deal if your physical problems made you give up an activity you love. Obese people find recumbent trikes more stable and easier on the joints than an ordinary bike. If you're riding a recumbent bike or trike, prioritize visibility. Drivers may not be looking for such low-slung vehicles, so wear bright colors and light your bike well if you ride after dark. However, recumbent trikes have a few special safety benefits. When you're pedaling uphill, you never have to worry that you'll tip over if you go too slowly. And if you get tired and need to rest, you can just pull over and relax without leaving your seat.